I first saw Saint Raymond (otherwise known as Callum) supporting HAIM early on in 2014 at The Ritz in Manchester. Having watched him having no clue who he was, I left the gig a fan and immediately downloaded his EP. Now with his first album out, he starts on his own headline tour. I saw him at the Liverpool Arts Club, which is a great little intimate venue that showcases up and coming artists. This was the second date of the tour and the band’s first gig in LIverpool! The crowd responded very well to Young Blood and Wild Heart, his music is easy to clap along to and the audience sang the hooks which Callum fed with gusto. Callum and the band frequently jammed among themselves, with a few guitar solos scattered across the set. The set also included a cover of Major Lazer’s recent hit, Lean On, which was brilliant, and there is a video of it below if you’d like to hear an alternative music this popular song. About halfway through the concert, the band went off-stage and left Callum in the spotlight with his guitar to sing As We Are Now. He told us that he wrote the song when his “mates pissed off to uni” which was a funny introduction to a lovely song. You may know another of his songs, Come Back To You,as it’s currently featured in the River Island TV advert. 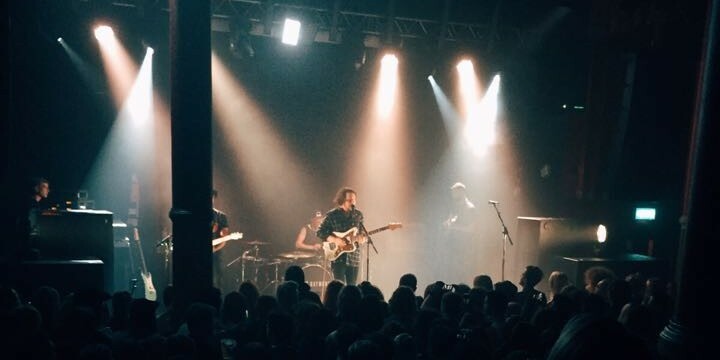 Saint Raymond have already started writing album number two, and performed an untitled song from it which went down a storm. The audience chanted from the moment the band went off to when they returned to the stage for a three song encore. Amazingly, Callum wrote one of the songs on his album, Bonfires, at age 15, which shows his talent as it’s one of my favourite songs off the album. He closed with Fall At Your Feet. My only criticism is that the jamming and the encore did drag out the concert longer than I expected, he possibly too often carried on past the end of the song by repeating the chorus hook, so that I felt ready to go by the final song, as his songs are great, but there isn’t the widest scope of variety. That being said, the fact that this guy is only 20 astounds me, as he has so much talent and stage presence, I believe his popularity will only keep growing and the venues will grow with him. So while he’s still performing in these smaller venues, I recommend you try and catch Saint Raymond!